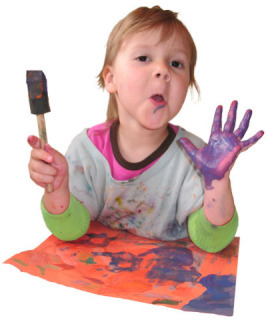 If your child is a messy eater or a budding artist who loves to finger paint, you are going to love this product! Arm Bibs Sleeve Protectors, created by mom Stephanie Stewart, are handy little products that fit on top of your child's arms to keep their little arms and clothing nice and clean. The easy-to-wear sleeves just slip on and off - there are no annoying ties or snaps to worry about. The comfy sleeves are stretchy yet snug enough to stay put. And Arm Bibs, made in the USA, are a breeze to clean. Just throw them in the washing machine. 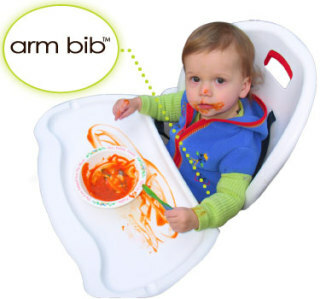 The bibs are available in two different colors, Smeared Avocado or Sweet Potato Mash, inspired by real food stains! And speaking of food stains - the company is asking consumers for input on the next color to be released. Select from Red Sauce Reality, Wandering Watermelon, Berry Bonanza or Chocolate Chaos - you decide! The set of two Arm Bibs retail for under $8.